What has two wheels, is made from five different bikes, and can carry all of your stuff for miles and miles on end? 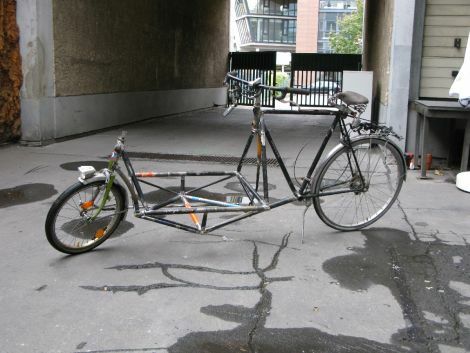 A Lastenrad is a cargo bike where the load sits in front of the rider rather than being towed behind. [Paul] wanted one for hauling things around town, and rather than buy one, he built one of his own. One thing we particularly like about this build is that the bike borrows parts from five other bicycles that were in various states of disrepair. That kind of re-use is something we can really get behind. [Paul] estimates the total build cost to be under 50 Euros, which is fantastic considering how useful his Lastenrad is. After logging about 100Km on the bike, he says that it handles quite well, and that even when fully loaded it is extremely easy to make his way about town. Continue reading to see a video of the bike’s first test ride.